The Mean Green Sewing Machine has been hard at work again today! 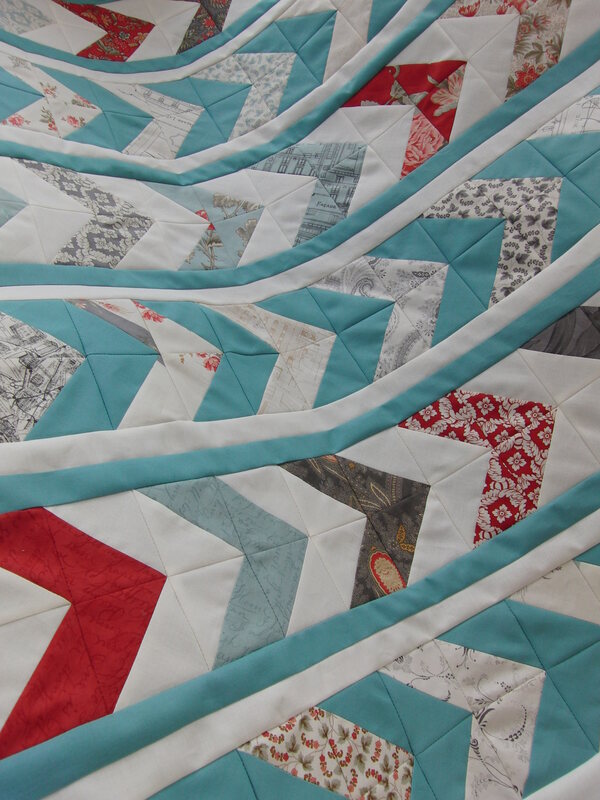 Here is another tutorial which documents the making of my latest quilt top. It is another episode in my quest to use up my birthday charm packs (I can’t buy any more until they are all used up). I gave a sneak preview of the work in progress a couple of days ago but thought, as I am taking photos of the rest of the process, I might as well share it with everyone else. However, I do realise I’m no expert and there will, of course, be other ways to make this. I just thought I’d share my way 🙂 I hope you like it! 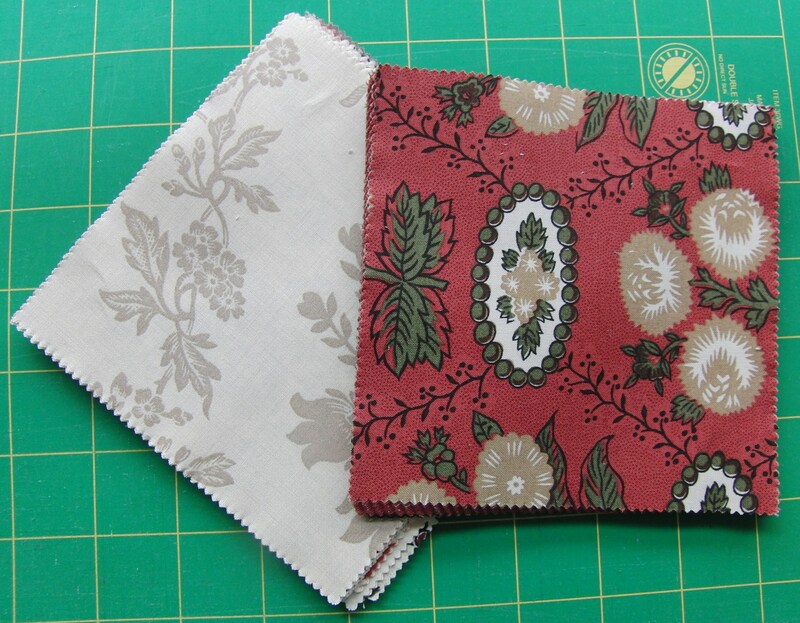 Start by cutting three dark and three light 5 inch strips across the width of fabric. I’ve used Moda Bella Solids Burgundy and Ivory. 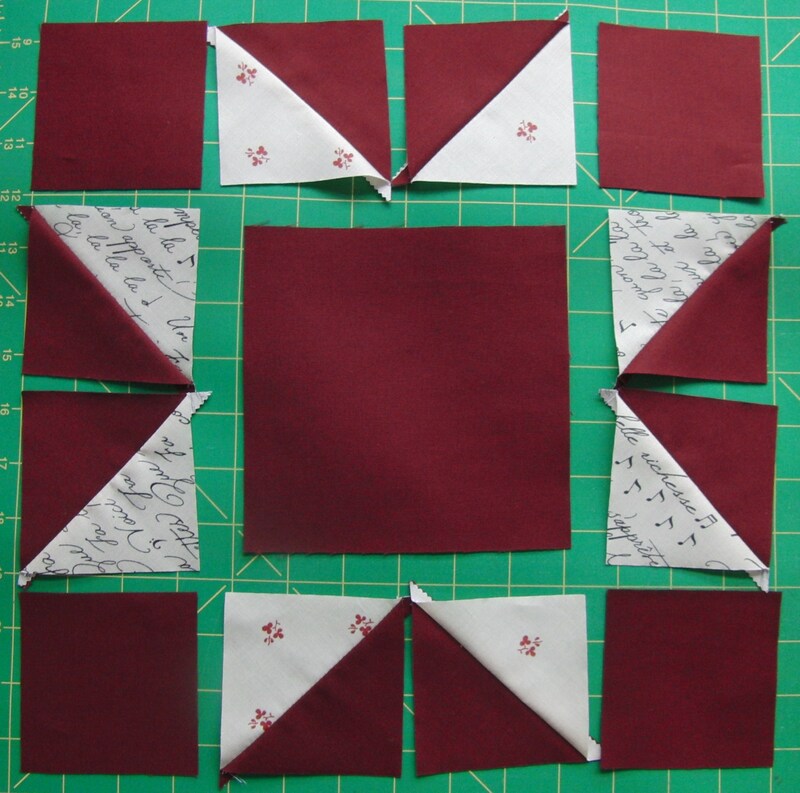 Cut twenty 5 inch squares from each colour. Take 2 squares from a charm pack and put them in your stash 🙂 I discarded two plain ones as I was using a lot of plain fabric anyway. You will only need 40 squares from the charm pack (most have 42). I used Fa La la La by Moda. Divide the charm squares into two piles of twenty lights and twenty darks (as best you can). Now, the fun begins! The lights are going to be paired with the dark solid squares and the darks are going to be paired with the light solid squares. Take one pair and put them right sides together. 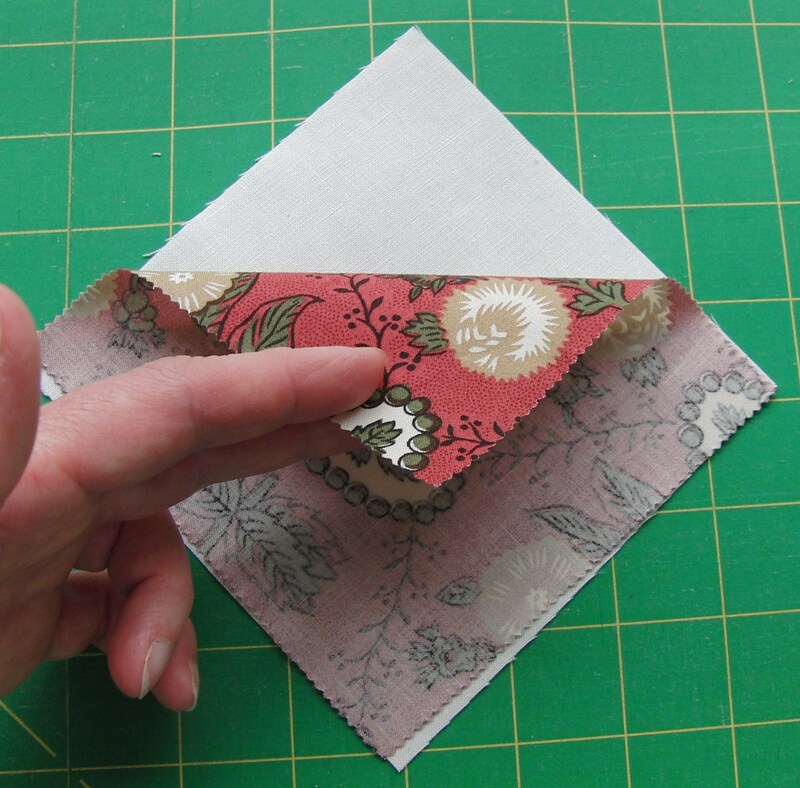 Sew together all the way around the edge with a one quarter inch seam. All seams will be the same width from now on. Make sure you sew all four sides. Then cut across both diagonals. Repeat this with all of the other pairs and then keep your groups of four together. 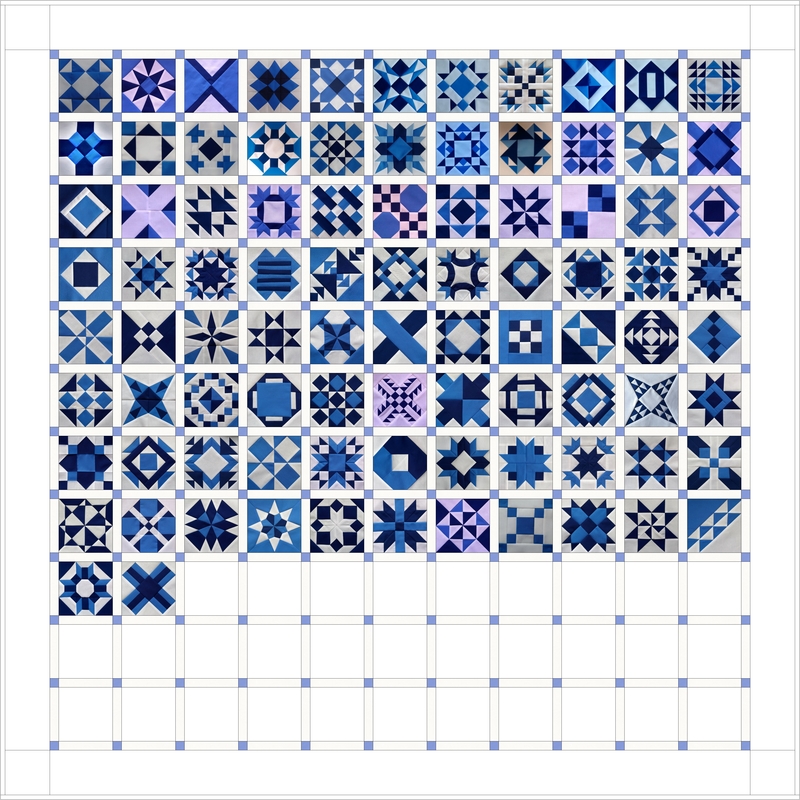 You should now have 160 small squares (40 groups of 4). Here are my dark charms with ivory solid fabric. 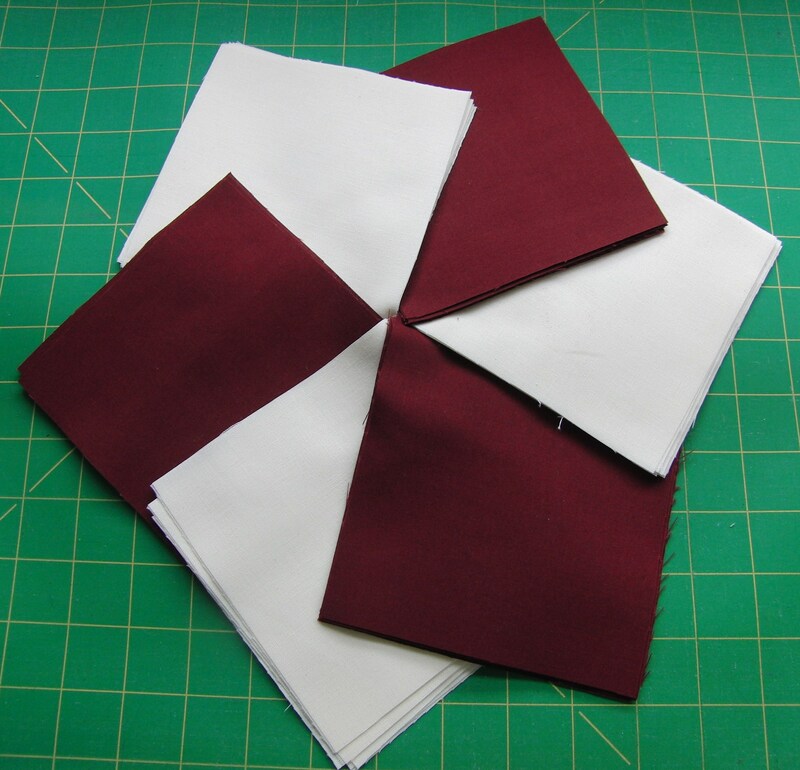 Here are my light charms with burgundy solid fabric. Next cut strips for the centre squares. 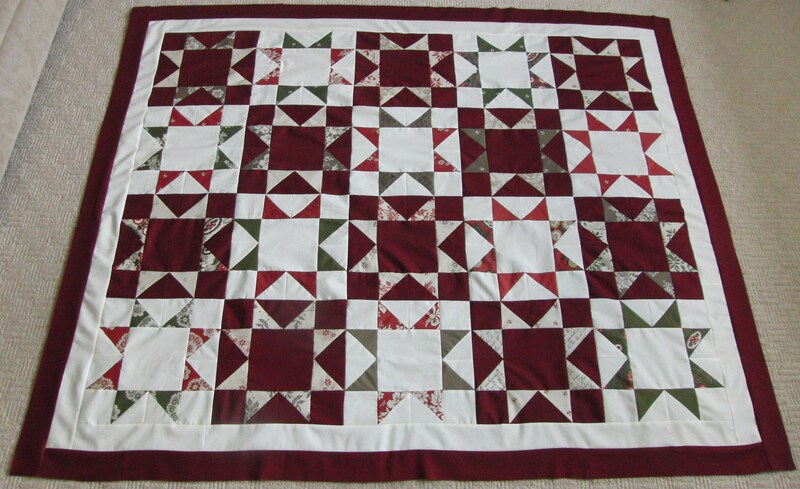 You need to cut 2 strips of each solid colour measuring five and seven eighths inches wide. I know this is a horrible width but I had to do this so I could leave the charm squares at 5 inches. Most rulers show eighths anyway. I hope your ruler does! From these strips cut 10 squares of each colour measuring five and seven eighths across. Now for the corner squares. 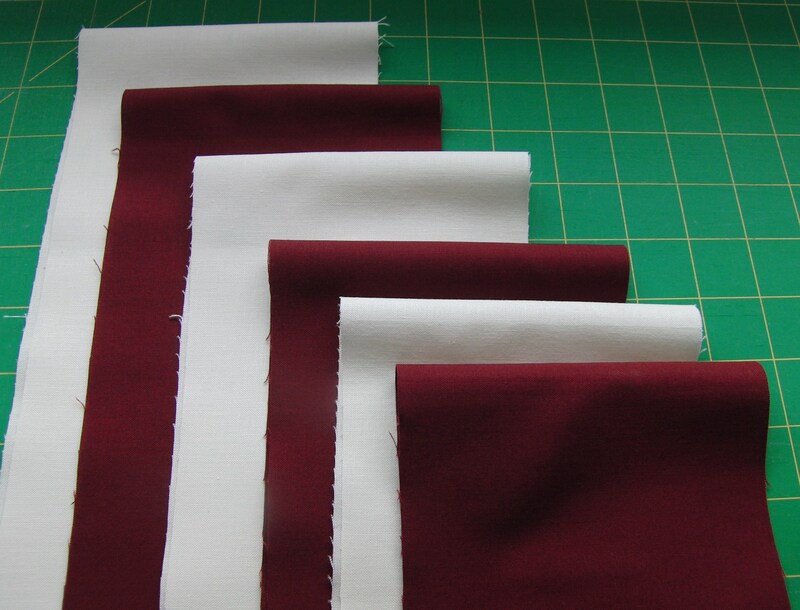 Cut 3 strips of each colour across the width of fabric measuring three and one quarter inches. 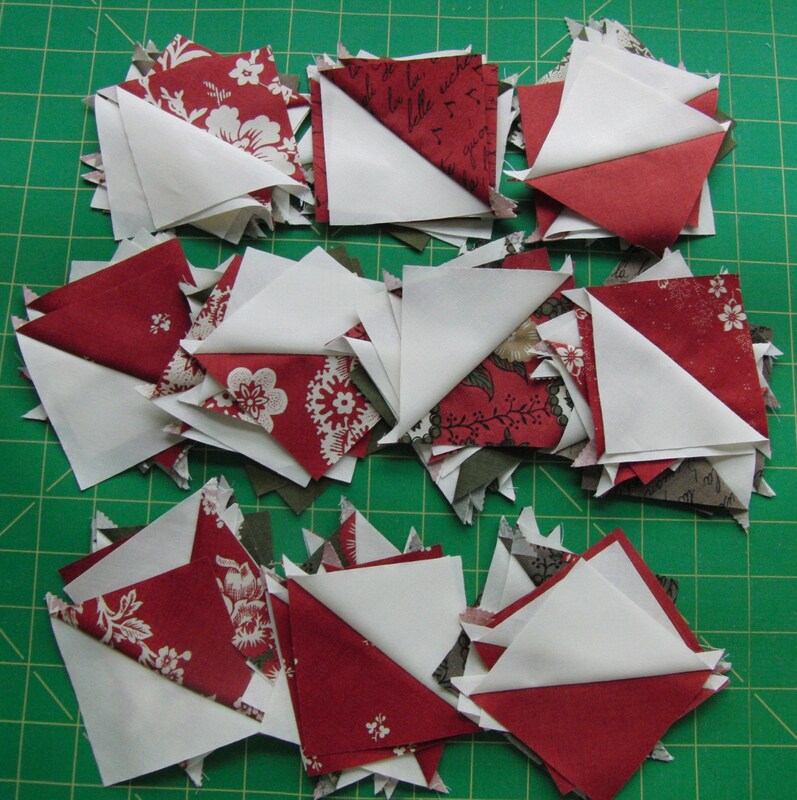 Cut these strips into three and one quarter inch squares. You will need 40 squares of each colour. 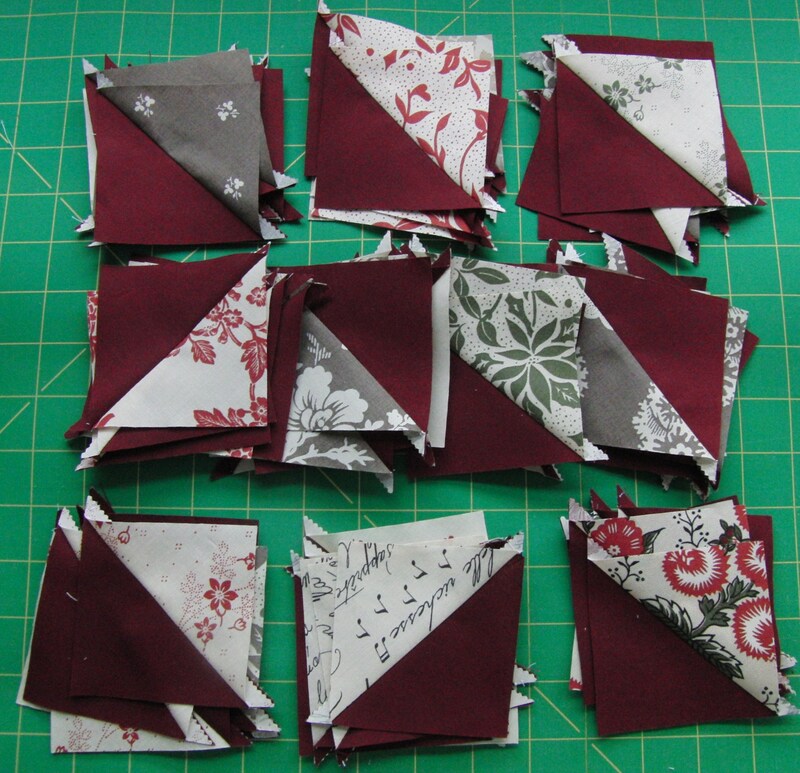 I managed to get 39 from my 3 strips and used the scraps from earlier to get the 40th. Now arrange the pieces to make one star block. I used two of my groups of four from earlier and placed matching pairs opposite each other. Take care to put one which was pressed towards the light fabric next to one which was pressed towards the dark fabric (so the seams will nest). Sew together the triangle pairs first. Remember to nest the seams so the points match up. 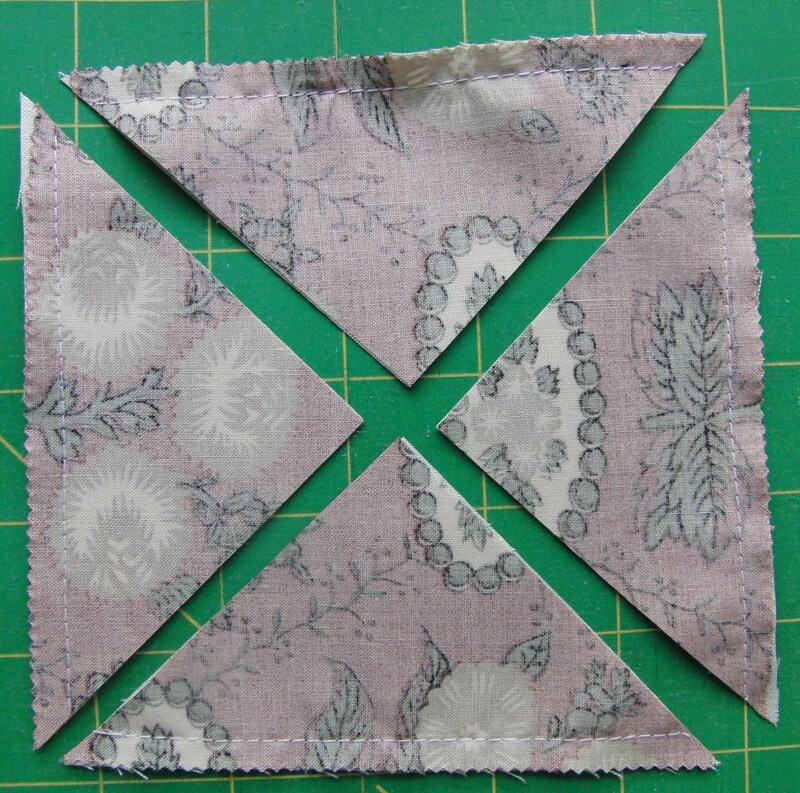 Sew the pieces together to make three rows. Then sew the rows together. Complete 20 star blocks. Arrange them into four rows of five. 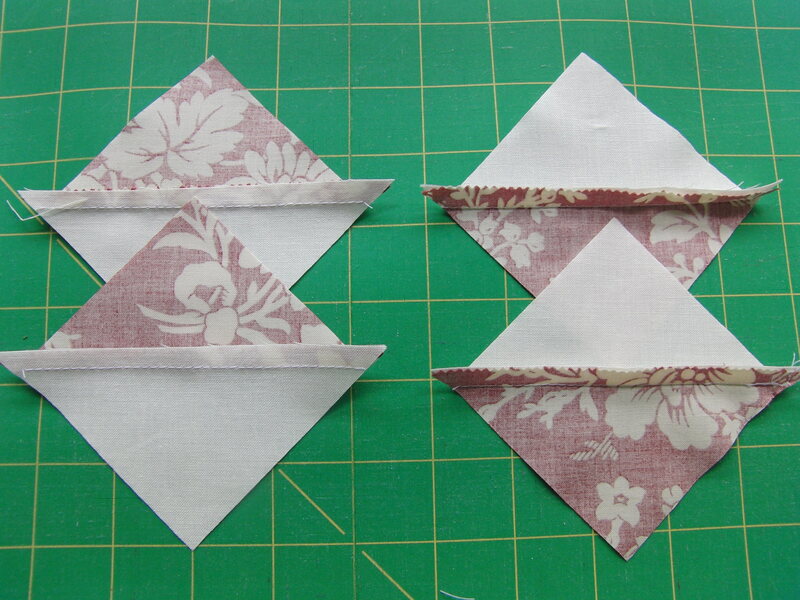 Sew the blocks in each row together. Sew rows one and two together. Then sew rows three and four together. Finally, sew the two double rows together. I’ve added two borders using 2 and a half inch strips. 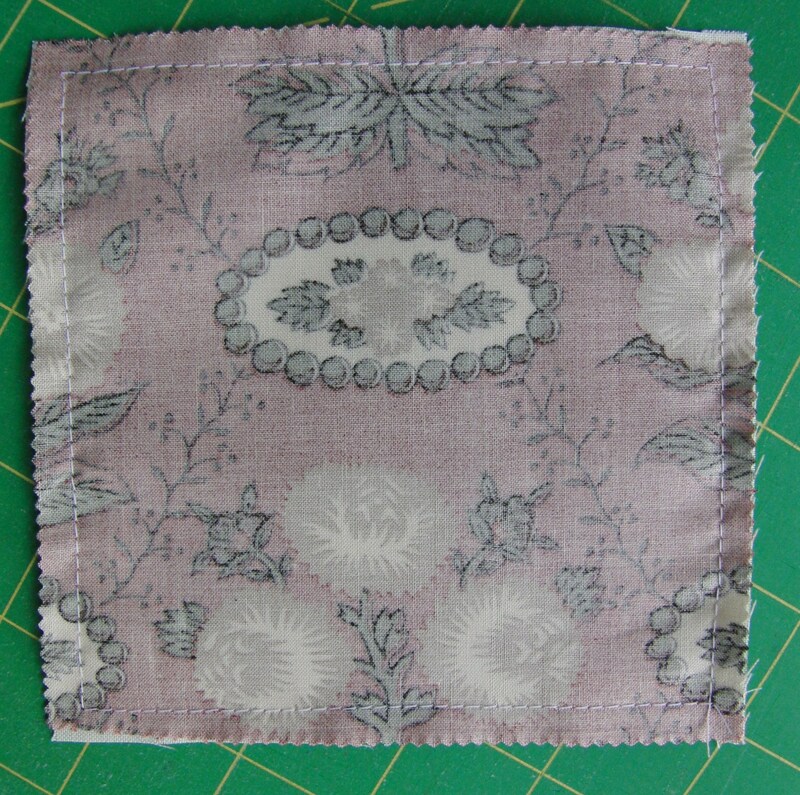 The inner border (ivory) needed 5 strips across the width of fabric. 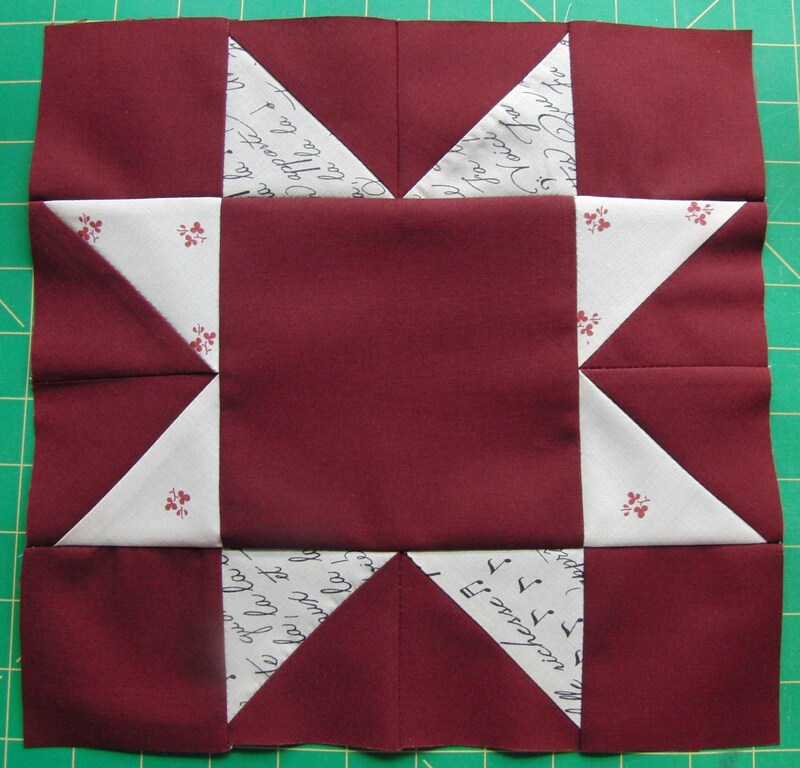 The outer border (burgundy) needed six strips. 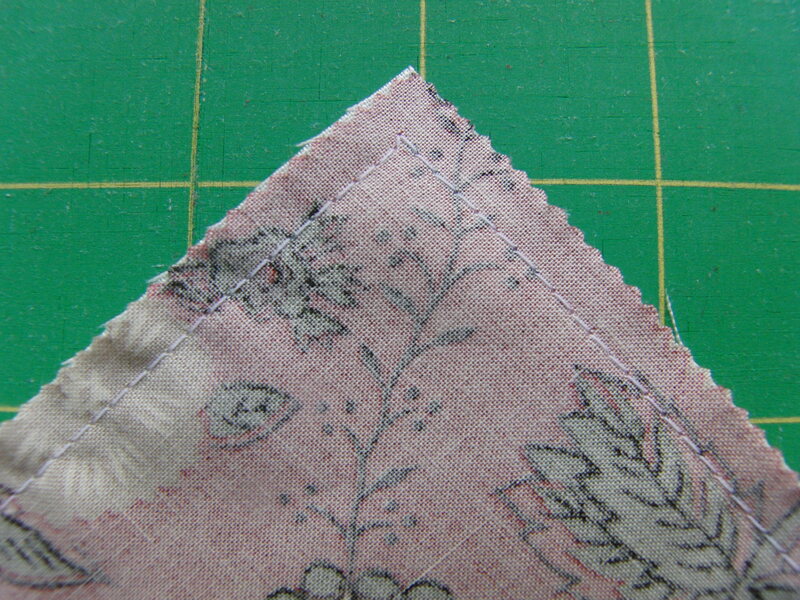 I attached each border in turn to the long sides first. Here is my finished quilt top. It measures 62 x 51 inches. Firstly, I don’t know the name of this block. I thought it was Ohio Star but now realise it isn’t. Does anyone have any ideas? No doubt there will be more than one accepted name for it. You can find more of my tutorials by clicking here.